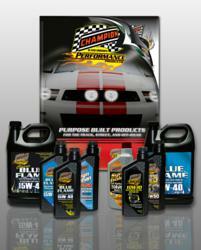 Champion Brands, a recognized leader in development and manufacturing of top-tier synthetic lubricants, announced today that the 2011 Champion Oil Performance & Racing Catalog is now available online. Champion Brands, celebrating its 55th year as an industry leader, develops synthetic motor oils for the racing, diesel, classic, vintage, hot rod, muscle car, and the engine builder markets. They manufacture numerous multi-viscosity motor oils with high zinc and phosphorous formulas designed to deliver the correct balance of chemistry to protect vintage and high performance engines, especially those using flat tappet and/or roller cams operating at high RPM's and requiring high-pressure valve springs.